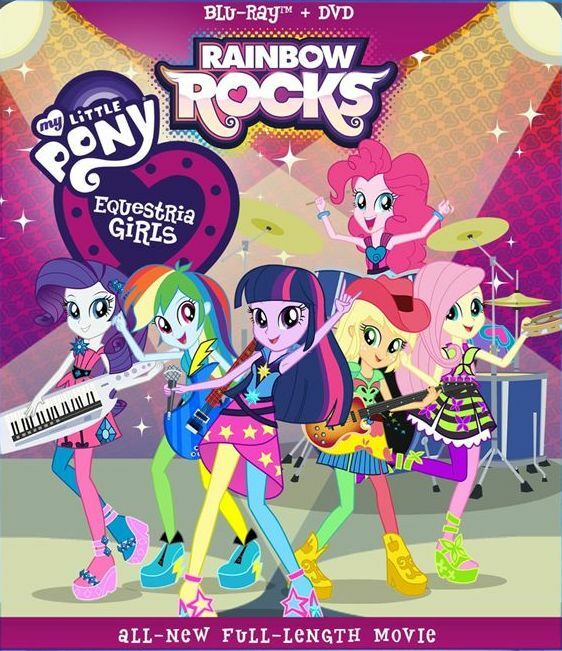 My Little Pony: Equestria Girls - Rainbow Rocks is the sequel to last year's My Little Pony: Equestria Girls movie. I have not seen the My Little Pony Friendship is Magic television show that these movies are based on, so these two films are still my only experience with that series. The previous movie was somewhat enjoyable though I felt it was lacking in the plot department and the character dynamics. I found this movie more entertaining, as even though the battle-of-the-bands plot is one that's pretty common, it still felt like more of a story and it gave reason to have both character interactions and songs that didn't feel like they popped out of nowhere. This movie finds the main antagonist of the previous film, Sunset, is no longer evil and is actually friends with the group of protagonist pony-girl counterparts. That line may not make much sense to you if you haven't seen the first movie... this takes place in the human world, not the pony world that the TV show takes place in, but in the human world there are these girls who have the same personalities, voices, and general look of the ponies in the pony world. That's one of the things I really liked about this story, that they took a bad guy and showed that it is possible to change for the better. That you're not defined by what you did, but what you chose to do. She not only became friends with the good guys, she was also willing to do whatever needed to be done to help them. And yet the other students in the school would still whisper and not trust her, which felt quite real and showed that although it can be done, it's not necessarily easy. The main story is thats three sirens who were banished from the pony world to the human world long ago now find that they have regained some of their former power, which is to be able sing and make people fight which releases energy they can feed on. So they plan to go big and head to high school to turn a musical showcase into a battle-of-the-bands. Meanwhile, the magic doesn't seem to affect the good pony girls, and they have their own band, but they need help figuring things out and get Princess Twilight to come from the pony world to their world. Together they must find a way to stop the sirens! The visuals here are pretty nice. They aren't amazing by any means, but they are very clean, crisp, and extremely colorful. The sound is also of excellent quality, but that's kind of expected since it's a new production, not some old film that's been converted. There are quite a few songs in this movie, and they aren't bad. Nothing I'd pay for but if they came up in a random playlist I wouldn't skip past them. There are also a bunch of animated shorts included as extra features, and an audio commentary which is somewhat interesting. All-in-all, this is a pretty decent release.